Balkan Sewer and Water Main Service uses Quikrete 5000 supplied by Package Pavement to ensure the integrity of its finished restorations. Quikrete 5000 has been independently tested and verified by the NYC DOT to reach 5600 PSI. This specialized product adds a long-lasting integrity to our work that “regular” cement and our competitors simply cannot match using inferior products of installation processes. Balkan uses concrete that is almost 2X stronger than required by NYC DOT code. Balkan’s Clients are never left with a pothole as reminder that we worked for them. Package Pavement Company was started in 1951 as a manufacturer of bagged blacktop. Our Founder, Walter G. Doherty began the company with the goal of helping homeowners make simple repairs to their blacktop driveways and paths. He developed an innovative patching material which, until compacted and exposed to the air, would be soft and easy to handle and transport. While the small business grew in size, Walter’s family became involved in both the bagging (by hand) and delivery to area hardware stores and utility companies. Over the last 50 years, contractors, utilities, towns, and cities throughout the northeast have found Package Pavement blacktop provides a clean and inexpensive solution to their patching needs. With our growing customer base and expertise in the industry, Package Pavement began to look to develop a new line of products and services to for our growing do-it-yourself consumer and contractor base. This expertise in the utility market, led Walter to create an asphalt plug for utility companies, which allowed them to patch up drill holes in asphalt roads. Plug-R bar hole and tent hole plugs are an important cog in rounding out the company list of products. In the early 1980’s Package Pavement became a licensed QUIKRETE manufacturer, giving the company the opportunity to rapidly expand our product line and produce highly recognized and industry leading products. To further enhance our product line, Package Pavement became a licensee of Spec Mix in the early 1990’s. With this innovative delivery system of spec mortars and grouts, Package Pavement is able to offer our clients a truly customized solution for any construction project. Our dedicated and knowledgeable staff, some of whom have been with the company for over a quarter of a century, are prepared to provide the answers to all your questions. We strive to provide you with a proven and consistent product which will create a safer, more consistent and efficient way of doing things. We have expanded our ability to serve you through our new Ravena, New York site. Package Pavement is still a family owned and operated business currently in the third generation of leadership. While we have grown a great deal in these 50 years, we still maintain the core concepts upon which the company was founded: produce the highest quality material and serve each customer with the collective goal of exceeding your expectations. With this philosophy in mind, we hope to have the opportunity to serve your business in the near future. The QUIKRETE Companies are the largest manufacturers of packaged concrete in the United States and an innovative leader in the commercial building and home improvement industries. With more than 90 manufacturing facilities in the United States, Canada, Puerto Rico and South America, The QUIKRETE Companies have unsurpassed product distribution and depth. The QUIKRETE Technical Center ensures that professionals and consumers alike are provided with the most innovative and highest quality products available on the market. Since 1940, The QUIKRETE Companies have produced more than 200 professional-grade and consumer products which fall into one of four categories: core products, commercial grade products, specialty products and repair products. Through these product lines, The QUIKRETE Companies offers concrete and mortar mixes; cements; concrete repair products; stucco, waterproofing, tile setting and blacktop products; floor underlayments; sand and aggregates; and other seasonal items. 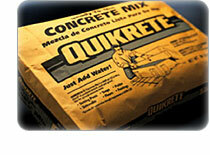 QUIKRETE concrete is used in building and refurbishing commercial projects all around the United States. QUIKRETE products have recently been used in diverse projects that include the National Museum of the American Indian (2004 Masonry Construction Project of the Year), the Georgia World Congress Center, the Boston Convention Center, as well as sports venues that include Safeco Park in Seattle, Coors Field in Denver and historic Fenway Park in Boston. QUIKRETE has more than 90 manufacturing facilities, with plants located throughout the United States, Canada, Puerto Rico and South America. Balkan Has The Safest Fleet In The Industry, NYS DMV L.E.N.S.